When my third son was born in early spring of this year, he arrived not quite properly put together. He was born with a dilated left kidney. It really shouldn't have been a surprise, but the Ob minimized the situation during my pregnancy. At the last minute I found my self expecting a baby with a condition that did not "go away before he was born". I had so many questions, and so few answers; my hospital was located in a small Belgian town where even the "translator" only spoke French! What do we call this thing? What tests will be done? Can he urinate properly? Will he need surgery right as he's born? And still no answers came. What a lesson in patience! Eventually we had a few tests done, some more invasive than others. We saw a specialist in Brussels and we saw a specialist at John's Hopkins in the U.S. We did a little research. We got frustrated by the language barrier in Belgium, and frustrated at the cost and speed in which things are done in the U.S. We waited for the possibility of an infection to occur. We wondered oh so many things about what was happening. Finley is now eight months old. Today we went back to the specialist in Brussels and he said "I am happy today about the progress of the kidney". A positive outlook! There has been a significant change from when he was born, in fact it is looking more normal every time we go in for a check-up. This summer, the specialist from John's Hopkins was ready to slice him open! But alas here he is now, a picture of health. I wonder if we hadn't have taken a look on the inside with these handy dandy ultrasounds, would we have ever known?! So, I say Finley is perfectly perfect! And I'll tell you why: Two days after he was born I was holding him tight and overwhelmed with emotion. 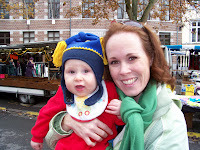 I was so grateful to have another beautiful redhead boy, but not certain what significance these health issues meant. I called my Dad to confess that everything wasn't ok as I led him to believe, that in fact Finley was born with a health problem. I could hear his sigh; he deflated. This is his grand baby! But he has never been one to dwell on the negative. So when I said to him it's just hard because I wanted Finley to be born perfect, he stopped me then and told me "But, he IS perfect." And there it was sinking into my soul, what do I know? But, of course! And I have believed it ever since. The course is till undetermined with this little one's kidney - and surgery is not ruled out yet. But for now. I just know that no matter what happens he came to us just as he was meant to come. Perfect! You brought me tears, I can just hear Dad's voice. I love you sis and am so happy that your baby gets more perfect everyday.